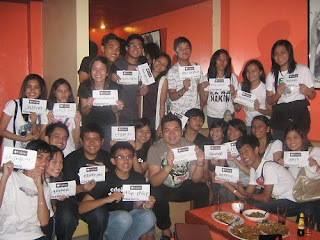 Just 2 months ago, I blogged about how successful the first-ever Tumblr meetup done in CDO was. Last June 15, we had the 2nd Meetup at Score Grill and Chill and it was again a blast! It was really really fun and was a big improvement from the 1st. To say it was successful is an understatement. I met new friends and they are some of the most awesome people in the world. We only talked, made chika, got to know each other, ate and sang our hearts out for around 5 hours but we immediately made ourselves comfortable with each other for that short period of time. I love these people and I can't wait to meet them again. The third meetup will probably be on December by the way :) I'm sure it will again be successful and bigger this time!